Y'know, I wasn't expecting to learn anything. I was expecting, like, y'know, 'abortion must be legal,' and maybe some history. This book though, actually, it made a really good point- that, like anything, when you split the argument into two binarily opposed sides- pro-life vs. pro-choice- you automatically lose perspective and the ability to discuss intelligently. Nobody is stoked about having an abortion. (Maybe somebody is. Most people are not.) A point Ms. Baumgardner drove thoroughly home is that, hey, lots of us think that it is a shame, and not really a good thing, to have an abortion- but that calling it not really a good thing doesn't mean being against it, thinking it should be illegal. So while it was kind of weird to be reading lines that were, y'know, sympathetic to the pro-life argument, it was also pretty eye-opening. And done a lot more delicately than I feel like I'm doing here. I don't know. I don't think I can do a good job explaining it; it took her 144 pages to make her point well. I recommend this book. Oh, also this thing made me cry on the BART, like, four separate times. 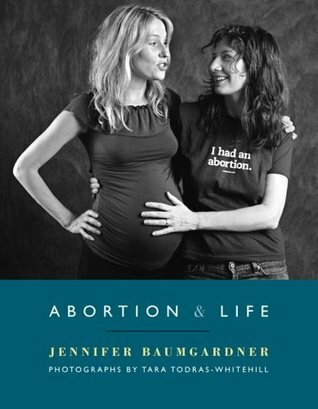 This book is written by Jennifer Baumgardner, who started the "I had an abortion" project in 2004. This book is part of that project. It starts with a brief history of abortion, a discussion of the project, an introduction to the "pro-voice" movement, and thoughts on feminism and the pro-life movement. The most valuable aspect of the first part was the discussion of the pro-voice movement. Pro-voice is the idea that it should be okay to talk about abortion as a bad thing, as something that we should work to decrease the frequency of, without being painted as being against abortion. It should be okay for a woman to have conflicting emotions about her own abortion without being shamed for it. It should be okay to say, "I believe that the fetus is a person, but I still believe in the right to choose". In fact, not only should all of these thoughts be okay to have, discussing them out in the open is the only way to get beyond the caustic dichotomy that defines the abortion debate today. Sadly, since this discussion covered only a chapter, Baumgardner did not go into much depth.The rest of the book is portraits and stories of women who got abortions. While not as deep as the stories in Choice True Stories of Birth Contraception Infertility Adoption Single Parenthood and Abortion -- that would be difficult when these stories are only a few pages each -- hearing the real stories of women who chose abortion is always an important reminder of how diverse and complicated these decisions are. This is a fantastic book. I, myself, am pro-choice already, but reading this book has made me more understanding about many of the issues surrounding the issue of abortion. I think it has helped me see the perspective of those who argue for pro-life and the importance of an open dialogue. The idea of the I Had an Abortion project is amazing in itself. I think it is great to share the stories of real women who have had abortions to help remove some of the stigma and silence of abortion. The stories included come from many different women who all had different experiences, but each show how abortion can be improved upon, such as counseling/support after the procedure and more openness about abortion itself, as well as legislative reform. Two of the chapters that I found most influential for me personally were the ones that focused on pro-voice and the possibility of being a feminist and being pro-life. Both of these chapters gave me a different way of looking at the issues in comparison to the traditional pro-choice viewpoint. I think these have helped me strengthen my pro-choice view while still being open to other viewpoints and experiences. The book also contains a resource guide that includes suggested books, magazines, websites, films, and documentaries as well as information on organizations and funding. This is a great book whether you have had an abortion or not. It focuses on stopping the silence of abortion and really listening to each other. Definitely an interesting read. A very thoughtful approach to the volatile issue of abortion rights in the US. Giving voice to the stories of women who have had an abortion - letting them speak to why they made that choice and what impact it had on their lives - was powerful. Baumgardner did a good job of exploring how abortion rights is not a black or white issue and has many factors that go into it.I especially appreciated the section that addressed whether a person can be both feminist and prolife. In a word: yes -- but yes qualified by saying that instead of being simply against abortion, a true feminist pro-life stance would include looking at how to reduce the issues that lead up to a woman being in the position of having an unwanted pregnancy in the first place. I was blown away to read that cheap generic birth control - the only hormonal birth control option available to many low-income women - contains only 80% of the hormones as are in name-brand more expensive pills. Low-income women are getting pregnant not due to a lack of foresight, but because they don't have access to pills that could help them prevent the pregnancies they don't want.This is the third or fourth Baumgardner book I've read and I so appreciate her perspective that feminism needs to be more inclusive and less defensive - as in the issue of abortion, being willing to talk about the hard parts of it, such as the fact that many women do suffer emotional trauma after having one. Personal accounts are accompanied by portraits taken by photographer Tara Todras-Whitehill, including pictures of women as famous as Ani DiFranco and Gloria Steinem, wearing the “I had an Abortion” t-shirt. This volume is not about yelling in the streets or holding picket signs; it is not about being confrontational and aggressive toward anti-choice “activists.” It is about presenting the facts of what women went through and showing how necessary abortion is in an imperfect world. As long as we are yelling at each other and threatening each other, rather than listening and talking calmly, we can’t reach an understanding. Abortion & Life has a buddha-like, gentle approach to the subject of abortion, not using the “us and them” mentality that is so common but rather showing why abortion is important, in hopes that we come to some understanding and that opponents of reproductive rights will attempt to practice tolerance. one of the things that frustrates me in the abortion debate is the focus on the fetus as opposed to the woman. the pro-life movement (or pro-birth, as i like to refer to them), has seemingly decided that any woman seeking an abortion is a terrible human being - without ever finding the root causes of WHY a woman needs an abortion. in "abortion & life," baumgardner profiles a number of women who have had abortions. to hear their stories is to gain an understanding of what makes women choose this option, how they feel afterwards (some sad, some relieved) what we can do to help make this terrible decision less isolating, less terrifying, less stigmatized. an important book. Interviewing women who have had abortions is the most effective means of "confronting" the abortion issue, and Baumgardner did a wonderful job. The stories come from women of a wide range of generations and backgrounds. No two stories, just like no two women, are alike. This book forces the reader to consider the individuals involved in the explosive political issue of abortion rather than seeing the issue in black and white. The book also contains helpful contacts in the index. It is rare that I feel grateful for a book; this is one of those works that makes the short list. excellent excellent excellent. Baumgardner introduces new ways of talking about abortion, getting beyond the prothis v. prothat debate. She asks how 3rd-wave (and beyond) feminists experience and think about reproductive rights perhaps differently than the 2nd-wave activists. In doing so she foregrounds women's voices; let's put women back in the center of this discussion, she seems to argue, an obvious but sometimes overlooked idea. Sidenote: I used this in my intro to women's studies course and was happy with what it elicited. It's not comprehensive -- it's short, readable, informative. A very thought-provoking book talking about the human side of abortion and the individual stories of women who underwent them. Abortion is not described as a black and white issue in the political sense, but rather a choice that women need to make in their individual lives-- a choice that they should be allowed to have, just as they should have the choice to raise a child in a healthy environment. The one thing that I think could have made the book better would be to add more personal stories-- they were moving and powerful, but fewer in number than I was expecting. Quick read on the history of abortion and some of the stories that are a part of Baumgardner's film. Made me want to see the documentary, also made me tear up on the DC Metrobus. I really enjoyed how even handed and fair she is in presenting both sides of the debate, and how it really does make more sense to fight for women's rights (regardless of what you believe) rather than fighting against them. I feel like a more informed advocate for our right to choose, and as a woman who, like most women, is forced to make tough choices about birth control. I really enjoyed this book. This book was a quick read. I read it in an afternoon. It highlights important points that the pro-choice movement sometimes misses and the same for the pro-life side. She does a great job at helping women tell their stories and explaining that abortion isn't just a politic issue. They are personal stories. I was deeply moved by these women's stories and the many many many others out there. There are some great facts about the subject of abortion with lots of references. If you're interested in learning more about this subject I highly recommend. This is a really an emotional and educational book. It provided really touching stories of women who have chosen to have abortions and those who chose to have children. It brings to light past issues and those that are still ongoing to this very day. It is important for people to be able to humanize the statistics that we often hear. Yes women have abortions; these are a few of their stories, all different and compelling. In addition to the author's primary mission of giving women a venue to speak out and share the stories of their abortions, there is a good chapter on the role of feminists in the pro-life movement and the need to bridge gaps, with recommendations of how they could better support women who choose to continue their pregnancies. Wow. This was so much more than I was expecting. Opens the door to more meaningful dialogue about abortion in the US. Highly recommended. In fact, I'm thinking about requiring this book in addition to the standard textbook for the intro to Women's Studies course I teach. Is "light" abortion reading possible? A must-read for all women. Pro-choice, yay, but Not as good as I hoped but an interesting look at abortion but also, some not as interesting stuff about pro-life. Beautiful photos, interesting interviews, and a modern perspective on abortion that is meaty and thought-provoking.